GlobeCore presents INEY refrigeration unit for vacuum evacuation and vacuum drying of solid insulation of 110 – 1150 kV power transformers during installation, servicing and repairs. The company manufactures three types of units, which differ in components, mode of operation and specifications, but are equally efficient..
first module – double stage refrigerator designed for generation of process cold (to negative 70оС) and a vacuum pump. The first module is a double stage unit for generating of process cold (minus 70оС). The Second module contains a vacuum pump and three backing pumps. You can select the option that best fits the requirements of your facility. 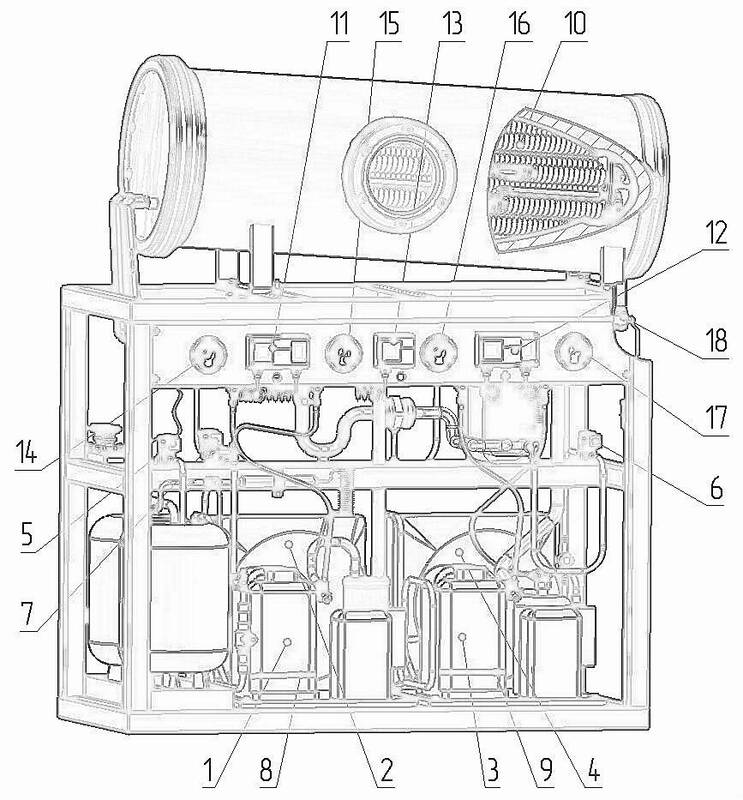 1 – compressor1; 2 – fan1; 3 – compressor2; 4 – fan2; 5 – solenoid valve; 6 – solenoid valve1; 7 – solenoid valve2; 8 – compressor crankcase heating1; 9 – compressor crankcase heating2; 10 – evaporator; 11 – two channel pressure relay1; 12 – two channel pressure relay2; 13 – single channel pressure relay ; 14 – pressure and vacuum gague “Input pressure”1; 15 – pressure and vacuum gague “Output pressure”1; 16 – pressure and vacuum gague “Input pressure”2; 17 – pressure and vacuum gague “Output pressure”2; 18 – condensate drain valve. The temperature on the surface of the evaporator gradually drops to the setpoint «-700С». When the setpoint temperature is reaches (-700С), the unit automatically switches to cyclic operation mode in the preset temperature range, with occasional stops of components. When a certain amount of moisture is frozen on the evaporator, it should be defrosted. The process takes approximately thirty minutes. Since the evaporator cools in the cold trap to -70оС, a difference in vapor pressure over the surface of solid insulation and in the trap. (E.g. saturated water vapor pressure at + 20 оС is 2337 Pa, and 18 Pa at – 40 оС). This difference drives the drying process. Water vapor from transformer tank move to the cold trap due to pressure difference and are frozen in the evaporator. Duration of drying depends on the amount of moisture in the transformer, its temperature, ambient temperature and residual pressure in the transformer tank. The unit can operate continuously for 20 days. In the side of the insulated cold trap there is a sight glass, which ensures visual observation of freezing process. The lower part of the trap is equipped with a condensate drain vlave to remove condensate after defrost. On average the unit can trap at least 7.5 kg of moisture in 24 hours. This equipment, just as any other GlobeCore product, is accordingly certified with presentation of the corresponding documents pertaining to product quality and standards. Manufacturing time of the unit, depending on options selected, is from 45 to 60 work days. GlobeCore offers an effective way of solving the problem of procuring modern efficient equipment for your facility. All you need to do is contact our sales manager, who will consult you and assist in required options, signing of sales contract and terms and conditions of sale and commissioning. From there the staff will manufacture the ordered product. At this stage, since it takes the longest, we invite you to visit the factory and witness the manufacturing process of your equipment and many other products as well. When the product is manufacture, it undergoes factory acceptance tests and is then shipped to the client. We are always open to cooperation and mutual benefit.